We have some rules that everyone needs to follow if you want to be a member of our clan. Please read all the rules and know they will be enforced. We are committed to FairPlay. Any member found to be using 3rd Party software of any kind will be kicked immediately. In order for us to stay in contact inside and outside of the game, ALL members who participate in war are encouraged to have the WeChat app. This makes it easier for everyone to stay in touch and communicate during wars without everyone having to be logged on to the game. You can find WeChat in the app store or google play. Ranks are earned by giving donations, being a team player, following instructions, and performing well in war. It takes time to earn ranks so be patient and you will get your ranks in due time. Please do not ask for ranks to be given. The Elders, COs, and Leader will decide when promotions are awarded. These will be based on your seasonal performance and how you interact with other clan members. With rank comes other rules and new responsibilities. Once ranks are awarded, the player will receive additional information on these. Failure to fulfil duties will result in demotion. This will be decided by the Leader and COs.
All members are expected to donate. Our top players will take care of troops during wars, but, everyone needs to donate outside of war. This is an important part of membership. Donate what is asked for. Don’t just dump troops in someone’s Clan Castle just to say you donated. If you don’t have what’s requested, let them know. They may choose something you do have. If someone requests “anything”, then give them anything. If you need specific troops or specific level troops, ask for them. But be reasonable. Don’t request high level DE troops several times in one day without donating equal value troops as well. NO HOPPERS!!! If you do not plan to stay and be a contributing member, then you should choose another clan. If you need to leave to visit friends, or request max troops, etc. let us know. While we discourage leaving for any reason, if you give notice it will prevent you from being rejected when you return. IF YOU ARE IN WAR, LEAVING IS NOT ALLOWED FOR ANY REASON! IF YOU LEAVE DURING WAR, YOU WILL NOT BE ACCEPTED BACK INTO THE CLAN! NO EXCEPTIONS! We are an active War Clan. We do wars up to 3 times a week. If you are in war you are expected to attack. All members MUST use both attacks. 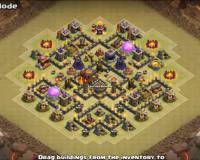 All members must attack with Clan Castle troops. The order of attack will be given out in a Clan Mail once war has started. This order is based on our opponent. The attack order must be followed. If you have a question or concern with the order, ask a CO or the Leader. Once you know your target, study the base and plan your attack. If you have questions about what troops to use or attack strategy, just ask. We are here to help. If you do not want to participate in war, for upgrading, etc., change your clan wars setting to “I’m Out!”. We know sometimes you may want a break, but, keep in mind we are a war clan and assume you want war when you join. If you need to be left out, let us know. 1. Defending Clan Castle troops will be donated by the highest level players involved in the war. If that is you then you donate. Period! Troops for attacking in war will be donated at the highest level possible. While we encourage our highest level players to fill war requests, the responsibility is that of the Elders & COs.
2. The bottom players (bottom half of players in war) will attack first. Your first attack will be against your mirror (#) or any EQUAL town hall level. During the first round of attacks do not attack another player’s target. 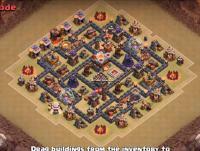 After the first round of attacks you will then use your remaining attack to cleanup any bases that have not been 3 starred.. This will be done in the first 12 hrs of the war. 3. Following the bottom players two attack rounds the top player’s attacks will begin. The top players (top half of players in war) will use a drop pattern to their attacks. Our #1 player will be responsible for the enemy’s #1 & #2 players. Our #2 player will be responsible for the enemy’s #3 & #4 players, and so on. These are general attack rules. Detailed attack orders will give given when Battle Day starts. Always ask a CO or the Leader if you have any questions or concerns. We want you to be successful and we are here to help. All clan members are encouraged to participate in Clan Games. The games benefit the entire clan as a whole. With the introduction of earnable clan XP for each tier completed, they’re even more beneficial. Just like with Clan Wars, no one is required to participate in the Clan Games. But, if you do decide to participate, you are required to meet a minimum amount of points. At this time, the required minimum is 500 points. The requirement is subject to change based on max points available and duration of the games. Any changes will be shared through clan mail. Now, that being said, we all know things come up that can prevent us from our normal activity in game. If you know you cannot reach the requirement, don’t participate. If you fall short of the requirement due to unexpected things, let us know what’s happening. "This content is not affiliated with, endorsed, sponsored, or specifically approved by Supercell and Supercell is not responsible for it. For more information see Supercell's Fan Content Policy: www.supercell.com/fan-content-policy."